Wick & Barnham United Football Club is no more after the teams decided to drop their merger agreement. Wick and Barnham football clubs merged in the summer of 2013 but both have now agreed to go their separate ways again. 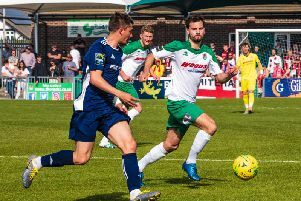 Wick will now operate under just their name ahead of their second season in the Southern Combination League Premier Division, while Barnham are set to continue but their future is less clear at the moment. Peter Whittle, chairman at Wick Football Club, admitted the deal did not really work over the three seasons it was in place. He said: “It came to a committee meeting and no-one really fought for it to remain in place. “I think it was originally hoped to go a little better than how it did in the end. “It’s one of those things and now both teams will have to go their separate ways. “Best of luck to everyone connected with Barnham and I hope they have some success in the coming seasons. Despite the merger deal breaking down, Whittle is confident most of the Wick playing squad from last year will remain. In a further change at the club, Jon Tucker is Wick’s manager for next season and he will be assisted by former Pagham reserve boss Lee Baldwin and Wesley Hallett. Richard Towers, who was joint boss with Tucker last season, has been offered another role with Wick but is still to come to a decision. Towers came in just a few weeks into last season with Wick still winless and struggling. However, he began to mould a team and in the end they ensured their safety in the Premier Division with several games to spare. Whittle added: “Jon was back with us for the second part of last season as joint manager. “This time last year he had the chance to lead us in the Premier Division after promotion but then moved on to Pagham. “He’s got a second chance here now, though, and will have the opportunity to be in charge of us in the Premier Division once again. “We did well towards the back end of last season and with a couple of fresh faces added to the squad, we can kick on next year. “Last season, we just wanted to make sure we managed to remain in this division. After doing that, we are looking to build now. “Jon has decided to bring Lee Baldwin to the club from Pagham reserves as his assistant and we wish him all the best. “Jon did well with us and guided us to promotion last time he was here and I have every confidence Jon can be successful with this club once again.